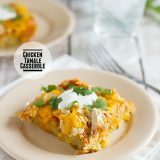 An easy way to have the flavors of tamales on a weeknight, this Chicken Tamale Casserole is super easy and packed with flavor. Preheat oven to 400°. Spray a 13×9-inch baking dish with cooking spray. Combine 1/4 cup cheese and milk, eggs, cumin, chili powder, corn, corn muffin mix and green chiles in a large bowl, stirring just until moist. Pour mixture into the prepared dish. Bake at 400° for 20 minutes or until set. Pierce entire surface liberally with a fork; pour enchilada sauce over top. Top with chicken; sprinkle with remaining 3/4 cup cheese. Continue to bake at 400° for 15 minutes or until cheese melts. Remove from oven; let stand 5 minutes. Cut into 8 pieces; top each serving with 1 tablespoon sour cream and cilantro, if desired.